We begin to stir at 05.30 in the morning as the sky slowly starts to grow lighter. Quickly, we are all awake, Peycho, I and our 3 passengers for the night. Coffee and breakfast is prepared as we loosen our anchor ropes and drift into the current again with the help of a couple of paddle strokes. By now, we have confident control of the raft. “Pantoja is on the left side of the river, so keep left if possible”. We have to land our raft in the Peruvian bordertown of Cabo Pantoja, without an engine, and it proves to be much easier than we expected: calm waters in front of the military checkpoint and river town of Pantoja. We drift along the military base that oversees the border and casually anchor ourselves on their floating pontoon. The officers are already present with curious questions about the nature of our homemade raft and if we have the correct papers. “Yes, we have all necessary documents” we politely inform them. The officer looks at our 3 passengers. “Y los pasejeros ?” he asks. “The passengers just came along for 2 days, they are disembarking here and on their own” we say.” “Bueno” he says. He sees our papers and are welcoming us into Peruvian waters. He is friendly but appears a little confused, as he doesn’t know what to do with our raft. Should he register us? Should we pay tax? He calls various people on his cellphone and shrugs his shoulders: “You don’t have an engine so you don’t have to pay any tax, you are considered a rustic vessel like a canoe”. He appears a bit disappointed, I think he had hoped that we needed to pay some tax, and then offer us a “cheaper deal” with him and share the profit among friends. He let us park our raft at the military base and allows us to walk with him through the base the 200m into town. Peycho and I pay a visit to the Peruvian immigration officer and get our officially needed stamps in our passports. So now we are 3 guys on the raft. It is a welcomed set of helping hands, for there is often things to do around here: repairs, cooking, fishing, cleaning and rowing. Especially rowing, nice to have an extra person to help move our giant raft out of danger. Misha decided to join us for the coming 2-3 weeks to the rivertown of Mazan and maybe longer. The days go by slowly and we attempt to float all day if the wind allows it. 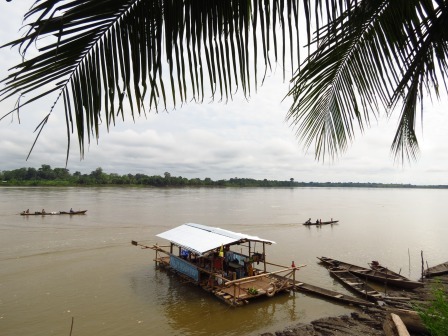 The Napo River continues its relentless path deeper and deeper into the jungle as we are drifting close to Peruvian Amazonian river-communities, watching them watching us. We wave and the parents wave back and so do some of the kids. Other kids are left silent, their gaze firmly locked at a little floating house with some foreign people on it. We are white. One of us has a huge beard. Local kids are starring. Shocked by what they see. The bypassing river traffic is scarce and consists of traditional dug-out canoes, a tree trunk shaped into a canoe by chiseling out a hollow section. I find them beautiful but extremely uncomfortable to sail in, as they appear unstable and have less than an inch of freeboard, the fine line between floating and sinking. The locals comfortably fit 10 people with kids playing and sleeping various places on these simple wooden canoes. They visit us a lot. Rarely does a local boatman see us without venturing closer to us and see who we are, talk and trade with us. The wind keeps causing us problem and we have several collisions. Damage the roof a bit, damage part of the raft-structure, nothing critical but enough to keep you entertained with repairs, practicing your carpentry skills. We are running out of good quality thick wood, as our oars keep breaking. Usually a chaotic situation in itself, the oars tend to break when you are pushing the hardest to avoid some oncoming dangers, at the mercy of the river. No control, drifting straight towards the very dangers you were trying to avoid and at least 10 minutes to repair the oar. It is an intense stress-cure: To be able to laugh when you know you are heading directly towards trouble and can do absolutely nothing. Learning to accept life and its random course and accept that nothing really is that serious for lucky little me playing around in the jungle. We encounter some strong, gale-force winds one day. We are on a fairly open section of the river, maybe a kilometer wide. The wind is raging behind us and we are doing 9km pr. hr., it’s good fun. But for a limited time only, because within long we will collide violently with the river-shore. We spin through several soft tree trunks that luckily takes some of the impact and we manage to collide without any damages. Then a giant floating tree is colliding into our anchored raft and get stuck: underneath and in the structure. It breaks part of the structure and with time we manage to release it from its stuck position underneath the raft. A strong wind can easily push us into danger and we can do nothing but to witness our forthcoming misery and laugh. In the end, everything will be alright. The mornings are magical. Sometimes I would wake up before dawn, put on my jungle-boots and grab my mid-size 16” machete. Going for a jungle walk, alone in the morning. Chopping through bushes and vines, birds singing around me in the tree tops, I can’t see them. I am encircled by a wall of green. In the jungle I can’t really see that much and I’ve learned to focus on the details: Walk slow, look at every little leave and you will notice the insects that inhabit this rainforest that covers a third of South America. Stand still and listen: there are millions of sounds from everywhere. Smell: the sweet, organic odor of the decaying jungle floor and newly produced, rich oxygen-laced air. Devil’s in the Details. The 31st of December, the last day of the year 2013. We are drifting along a quite, serene section of the Napo River, blue skies, no win, 28 C, fishing and photographing from the raft, birds and insects the only sound you hear. “It’s the 31st today”, someone says. We stop our raft in a quite little cove, make some drinks, swim and enjoy the river and our lives. What a wicked place to be for New Years: isolated, serene Rio Napo on our own raft. 2013 brought me many experiences and have left memories for years to come. I welcome 2014. Just a bit confused….. Where the hell are you? It is extraordinary to read about…. And see the pics. 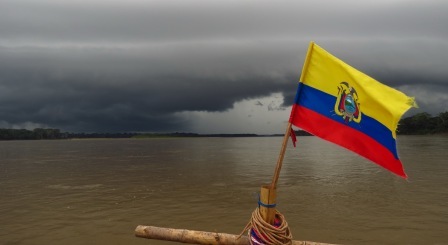 We are currently in Leticia, at the tri-border with Colombia, Brazil and Peru. 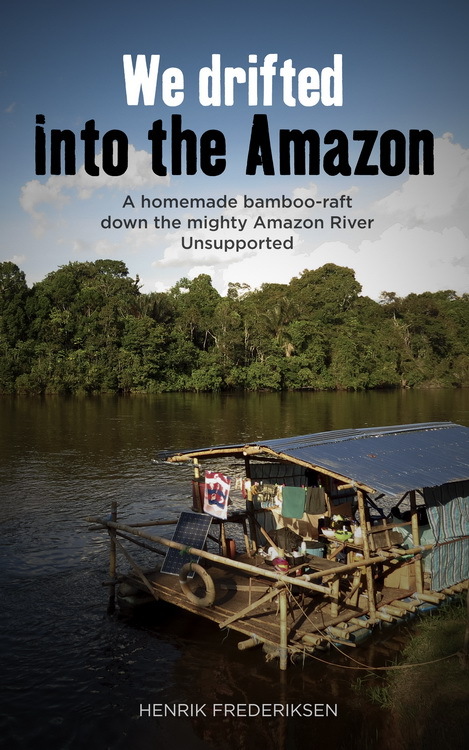 The blog posts are obviously behind, as I can only post when I have internet, which is very scarce and poor here in the Amazon. Ive added a little box in the top righthand side of the website, to inform of our last known location. in the meantime we continue on 2 wheels from around medellin…. Great to hear from you Christopher. We are all doing fine, ready to enter Brazil now, they wanted many documents and required us to buy a VHF radio in order to allow us entry into their waters. Hope you are enjoying Colombia, everybody says it is very very nice there. Smiles from us! Love reading your blog telling about your adventures.